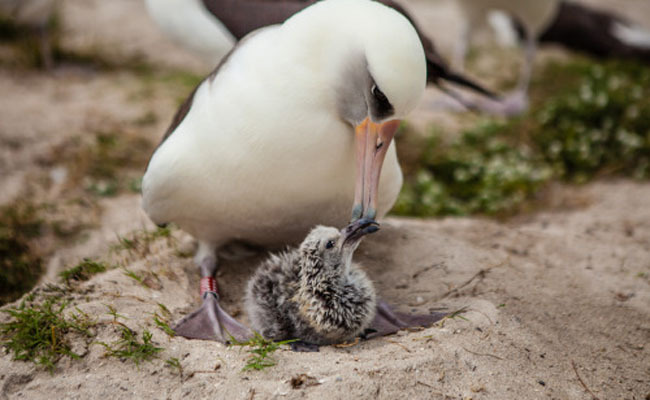 World’s Oldest Known Wild Bird is a Mother Again! Wisdom, a Laysan albatross who is now the oldest known banded bird in the world, has continued to surprise wildlife officials and her fans by reappearing every year at the Midway Atoll National Wildlife Refuge in the Pacific, and this year was no exception. Now believed to be at least 65 years old, Wisdom returned again earlier this year with her mate who has been dubbed Goo or Mr. Goo by refuge staff because of the number on his leg band. Wisdom was spotted earlier this winter incubating yet another egg. Earlier this month, to the delight of her fans, the U.S. Fish and Wildlife Service announced that her newest chick was spotted and was named Kūkini, which is Hawaiian for messenger. Amazing and so wonderful. Bless her heart! What a wonderful and heart-warming story thank you for sharing.